Motorola G5 review | What Hi-Fi? Motorola’s Moto G line of budget handsets has been one of the company’s biggest success stories of recent years, offering a really well specced budget handset at a sub-£200 price. The Moto G5, and its larger 5.2in G5 Plus sibling, follows admirably in these footsteps, promising ‘Premium for All’ with a new aluminium body. But is it a phone to consider if you put audio and video at the top of your wishlist? The G5’s 5in screen actually takes a step down from last year’s 5.5in G4 but maintains the same 1080p resolution. It means it offers a decent 441 pixels per inch and is decently sharp when you’re watching videos. The G5’s more budget processing means fine detail isn’t as well rendered here as it is on pricier phones, so textures lack some depth and pictures look flatter. We also notice more colour banding than we’ve seen elsewhere, and motion that isn’t as smooth, but it’s an enjoyable picture for its price. Colours can be set to Standard or Vibrant in the display settings. Despite similar options on competitor handsets looking overdone, we don’t find Vibrant does that here. In fact, it gives some welcome added punch to colours while keeping things looking realistic. Contrast, on the other hand, leaves us wanting. While we’re not expecting the inky blacks of an AMOLED display, blacks don’t get anywhere near deep enough for really convincing dark scenes, while highlights are often overblown and lacking in detail. The screen goes bright for most situations but is noticeably duller than something like the Samsung Galaxy A5, and extended use in bright sunlight might prove tricky. Budget handsets are often made out of plastic to keep costs low, but the Moto G5 (and its G5 Plus sibling) deliver the range’s first metal finish. The removable back panel is made mostly from aluminium, top and tailed by a plastic bumper to make it more durable to knocks and drops. Despite Moto’s best attempts though, the handset still looks and feels a little budget. It’s hard to put your finger on exactly why – be it the thicker bezels or the shiny plastic trim that edges the front of the display – but you won’t fool anyone into thinking you’re using a flagship handset. It just lacks the refinement of a pricier device and there doesn’t appear to be any anti-fingerprint coating to prevent it looking grubby either. Still, it’s a good size for one-handed use, having a volume rocker and textured power button sitting within easy reach on the right-hand side. There’s a 3.5mm headphone jack along the top edge with the phone’s microUSB charging port along the bottom. It’s a shame to see Moto stick with this older tech over the newer USB-C connection, but it ultimately makes little difference. The phone is still compatible with the company’s rapid charging technology, and the 10W TurboCharge charger is included in the box. For the first time at this level, the G5 packs a fingerprint scanner, previously introduced on the G4 Plus. It’s a static scanner instead of a button, with touch icons on the screen itself for controlling navigation. To free up some space on the screen, you can change this so the sensor handles these instead, something Moto calls “one-button nav” which we find a much better set-up. It turns the scanner into a mini touchpad. This means that a single tap on it will take you out of whatever you’re doing and back to the homescreen, a swipe left will go back a single step and swipe right will open up multitasking. It’s smooth and responsive, as is the fingerprint scanner. We couldn’t determine much difference in unlocking speed between the G5 and the iPhone 7, so there are certainly no grumbles here. Performance manages to be pretty snappy for most regular tasks, a lot of which is probably down to the unfussy, near-stock Android 7.0 operating system. We notice a few slowdowns during particularly heavy multitasking, but that’s only when we purposefully test its limits rather than undertaking our usual day-to-day usage. We do notice that switching tabs from the multitasking menu takes a few moments longer than phones with more powerful chipsets, and you might find yourself waiting a touch longer for games, apps and webpages to load too. It’s a Qualcomm Snapdragon 430 processor running the show here, and our review sample backs that up with 3GB RAM – a version of the phone only available directly on Amazon. It’s only £10 more than the 2GB version available in shops too, and is well worth the extra outlay. Casual gamers will find themselves well catered for here with the Adreno 505 GPU, but more graphic-heavy games can stutter under pressure. We play Asphalt 8 at the highest quality and while it runs just fine for the most part, we do notice a few dropped frames every now and then. Battery life holds up its end of the bargain, with the 2,800mAh removable cell lasting near enough a full day under normal use. We found lots of streaming does hit the battery harder than we’ve seen on handsets with cleverer chipsets, but that’s probably to be expected at this level. For example, an hour’s worth of streaming from Netflix at half brightness sees the G5 dropping 10% of its overall battery, which is double that of the same test on the Samsung Galaxy A5. Of course, the fact it’s removable means you can always have a spare at the ready or, more likely, replace it when its charge starts dropping off after 18 months or so. While the G5’s screen offers a decent performance for its price, the audio leaves a bit more to be desired. Through a pair of headphones the sound is rather flat, offering very little in the way of fine detail or dynamics. It opts for a forward presentation that sounds a little coarse and unrefined, squashing dynamic range and space with equal abandon. Its external speaker performs better by comparison. It’s a single forward-facing speaker housed inside the earpiece, which allows it to be clear and direct. Like most external speakers, it’s not the weightiest, but it does a decent job with vocals and dialogue. You may want to consider headphones for explosion-heavy action scenes though. You’ll also want to consider making use of the microSD card slot if you’re planning on storing much by way of music and movies on the device. With only 10GB of storage to play with after the OS has taken its chunk, it won’t be long until many users will be running out of room. The good news is the G5 supports up to 128GB microSD cards, which should give you plenty of space. Cameras on the G5 are covered by a main 13MP snapper and 5MP selfie cam. They are better than previous efforts from the G line but still struggle to really perform in anything other than good light. Take your photos at these times and you’re likely to get pleasing results, with good colours, sharp outlines and decent detail. The shutter fires when you touch the screen, and is fast enough to take snap after snap without a stutter. Focus proves to be hit and miss though, with pictures often looking soft or blurry unless you or your subject are completely still. This gets worse still in poorly lit scenarios, with a considerable amount of noise creeping in once the light dips past its best. Performance here should be better on its bigger brother, the G5 Plus packing a wider f/1.7 aperture and improved sensor. 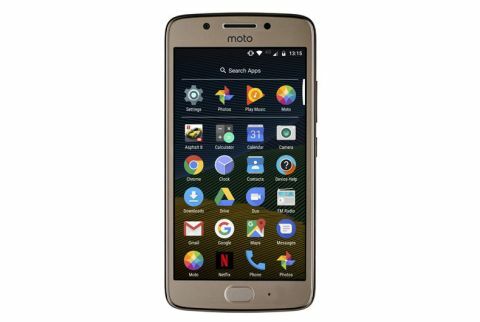 The G5 adds another successful handset to Moto’s growing line of budget wins. That said, considering its strong performance almost entirely across the board we can’t help but find its audio performance a bit of a let-down, even at this level. If you’re wanting your phone to double up as your main portable music player, that’s worth bearing in mind.